HF: In 1909 Sir AR Binnie and Son merged with another UK engineering consultancy to become Sir Alexander Binnie, Son and Deacon. Later later this company became Binnie & Partners and from the 1990s it has been part of the multi-national Black and Veatch consultancy. The company also participated in a large desalination plant, Lok On Pai, near Tun Muen, which was commissioned in 1975. It was however decommissioned in 1981 because its operation was more expensive than importing water from China. Thanks to IDJ who supplied the following timeline which provides a guide to the projects of Binnie & Partners/Black & Veatch in Hong Kong. 1929 – Hong Kong experiences a drought, with the Government implementing Stage VII water restriction. About 70,000 Hong Kong residents return to Guangdong. 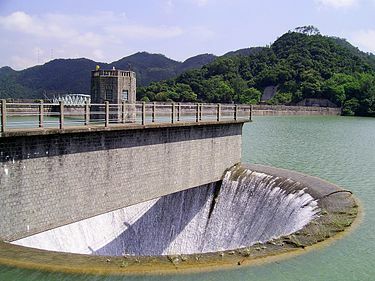 1930 – Based on a growing reputation for major water infrastructure around the world, Hong Kong commissions Black & Veatch (Binnie & Partners) to lead the Shing Mun Water Scheme. 1939 – Completion of the Shing Mun Water Scheme; Black & Veatch delivers the project 15 months ahead of schedule, and Chief Resident Engineer, Brigadier Hull, hands back HK$1million to the government. 1940 – World War II takes hold from Europe to Asia Pacific; W J E Binnie, returning from consulting work in Hong Kong, has to escape Algiers to British occupied Gibraltar acting as a washer up for a ship’s Chinese cook. 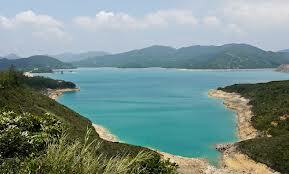 1953 – Construction begins at Tai Lam Chung Reservoir. Brigadier Hull leads the project again and constructs a famous zig-zag into the dam wall alignment – contrary to original plans but based on observations and judgment while working at the site. 1955-63 – The Shek Pik Reservoir modernised the water supply on Hong Kong Island (and later to outlying islands); many residents moved from water well supplies to tap water. 1961-1973 – Plover Cove Scheme – Black & Veatch transforms the sea into a freshwater reservoir – first time it is ever done in Hong Kong. 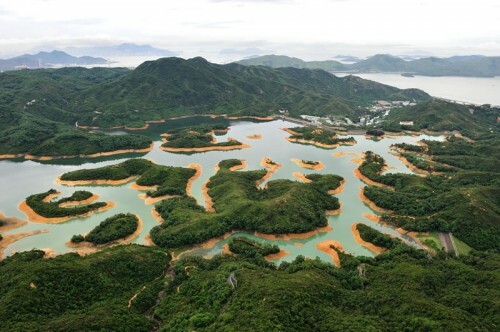 A complex system of catchwaters, dropshafts and tunnels collect mountain runoff into Plover Cove Reservoir. 1964 – Black & Veatch office is formally established. The company branched out services to infrastructure and land planning, geotechnical engineering and leisure engineering. 1964 – Completion of Tasek dam in Brunei; Black & Veatch exports Hong Kong rock to use in its construction. 1972-1977 – Design of the water treatment system and power generation for Hong Kong’s new Ocean Park – a major tourist attraction to this day. 1973 – Black & Veatch’s Hong Kong operation grows to a staff of 200, with 95 percent of the professionals from Hong Kong. 1972-1978 – High Island Water Scheme – the project will become an icon of Hong Kong Engineering, taming Hong Kong’s waters to create a new and sustainable source of drinking water. 1973-83 – Following tragic landslides in Hong Kong in the 1970s, Black & Veatch conducts 10 years of important hill stabilization surveying, design and implementation works for the government’s Geotechnical Control Office and Housing Authority. 1976 – Lok On Pai Desalter – Black & Veatch completes what was at the time the world’s largest Desalination Plant and Hong Kong’s first. 1980s – New technology brings new ways of work. Black & Veatch develops a large computational model to predict the effect of proposed land reclamation and port development in Victoria Harbour, Hong Kong; our professionals collect and analyse nearly 1,000 water samples. 1980-2000 – Engineered flood protection and urban infrastructure for the 280,000 residents of Yuen Long and Tin Shui Wai New Town including more than 20 kilometres of fresh/salt water pipeline, a drainage network for a catchment basin of 2,300 hectares, a sewerage network for 280,000 residents and the 64-hectare Hong Kong Wetland Park. 1992 – Study begins on Floodplain Basin Management Plan and progresses into Drainage Master Plans, covering more than half of Hong Kong. Black & Veatch goes on to engineer major improvement works for urban and rural drainage in West Kowloon, East Kowloon and North-western New Territories. 1995 – Black & Veatch acquires Binnie & Partners, enriching the office’s heritage of Building a World of Difference throughout the globe. 1999 – Design of the centralised automatic irrigation system for landscaping and 12-hectare artificial lake at Hong Kong Disneyland, reusing raw water and surface runoff from adjoining catchments. 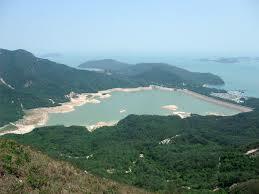 2000 – High Island Water Scheme is awarded as one of the Ten Engineering Wonders in Hong Kong by the HKIE. A motif of the High Island Water Scheme is also scheduled to appear on the reverse side of the new Bank of China HK$500 note in 2011. 2000-ongoing – Work begins on one of the largest pipeline rehabilitation programs in the world to ensure the long-term availability and reliability of Hong Kong’s water supply. Using innovative trenchless technology techniques, by 2010 Black & Veatch professionals will have engineered the renovation of 1,000 kilometres of pipelines. 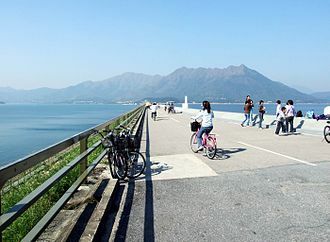 2002 – Tai Hang Tung pioneering Flood Storage Scheme receives the Innovation Award for the Construction Industry by HKIE. 2006 – After working since 1994 on numerous aspects of the Tai Po Water Treatment Works and Aqueducts, the project wins the global grand prize in the Design Projects category at the International Water Association Awards. 2008 – Black & Veatch helps introduce wastewater infrastructure to villages around Hong Kong, improving sanitation and the environment for people living in Northern and Western New Territories. 2009 – Hong Kong’s first underground reservoir is built on the University of Hong Kong’s campus; its design, cost and time savings and environmental impact is recognized by Hong Kong and international awards. This article was first posted on 7th October 2014.